After we fixed the gestetner and convinced Harry Ball to join us on the Electric Goosebum, we produced the RH end of the show with the following: Looped MC (ca 1990) sample on the Casio SK-10; Radio Flash Fudd cassette; 2 string First Act toy guitar, Casio SK-10 organ setting and clarinet setting; Herr Schurdt on iPhone samples and police scanner and Mannlicher Carcano's October 2008 appearance on Let's Paint TV! 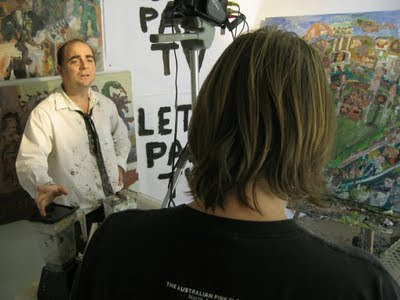 Image: Mannlicher Carcano's October 2008 appearance on Let's Paint TV: Host John Kilduff, back of Porter's head, painting of MC playing a sports stadium. 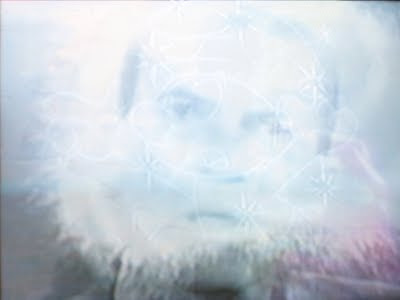 Just trying out this embedded streaming audio thingy. If it works, this should be The Ballad of Indian Ned, the single from Crawl to Safety... with Mannlicher Carcano, featuring The Jock on vocals. Sound generation from RH's audio dungeon Aug 15th 2009: Casio SK-10 with looped sample of practice chanter; ultra rare RH solo 8-track noise tape 'Blossom' manipulated on modified 8-track player; cassette of unreleased 1990? MC performance 'Utterly Utterly MC', Casio SK-10 preprogrammed rhythm, altered; 2-stringed 'First Act' toy electric guitar; manipulated 8 track Gangbusters "Counterfeiters" old time radio show (Dec 1949), re-fed CFRU stream; Casio SK-10 default organ sound. Gogo in Winnipeg, Porter jamming on a lawn with a dozen people in Nova Scotia (via SKYPE); Ken Cheesy OMIGOD! Another great show. Download or listen to it here. PS: Episode 2 of Jon "wobbly" Leidecker's podcast history of audio collage is a corker, and available online here.